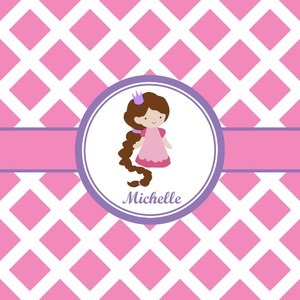 This princess themed print full of little girl pink and purple makes the statement that your little girl is The Princess. This print features every princess's dream full of castles, crowns, her very own prince frog to kiss, and lots of hearts fluttering about. The bottom of the design is a coordinating pink and white diamond pattern. The center focal point of the design is a lovely pink band, trimmed in coordinating purple with a large label for personalization.